This tutorial will show you step by step how to burn MP3 music files or folders to a CD in a few different ways using free and paid CD burning software on Windows, macOS, and Linux computers. 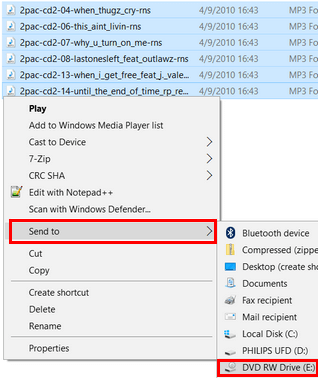 This tutorial will also show you how to make and burn an MP3 CD in Windows 7, 8 and 10 in two different ways without using third-party CD burning software. An MP3 CD is a data CD that contains digital music in the MP3 audio file format and can only be played on CD players that support this audio file format. Can you play an MP3 CD in a CD player? You can only play an MP3 CD in a CD player that supports the MP3 audio file format. However, most modern CD players support the MP3 audio file format. Can you play an MP3 CD in a car stereo? You can only play an MP3 CD in a car stereo that supports the MP3 audio file format. However, most modern car stereos support the MP3 audio file format. What is the difference between an Audio CD and an MP3 CD? The difference between an Audio CD and MP3 CD is that an Audio CD contains uncompressed digital music and an MP3 CD is a data CD that contains compressed digital music in the MP3 audio file format. An Audio CD can be played on computers and on any CD player and car stereo, while an MP3 CD can only be played on computers and on CD players and car stereos that support the MP3 audio file format. How many songs can fit on an MP3 CD? The amount of songs that can fit on an MP3 CD depends on the file size of the MP3 files and the capacity of the CD (e.g., 650 MB or 700 MB). 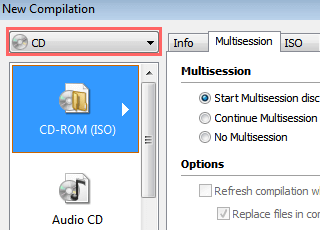 If you want to make and burn an MP3 CD with folders, then it's a good idea to create folders on your computer and then copy the MP3 files in these folders before you continue. 3. Move your mouse cursor (pointer) on Audio + Music and then click on Create MP3 or WMA Disc. 4. 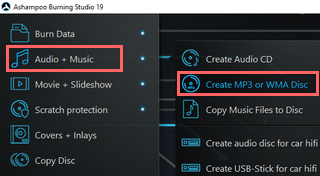 At Output Format, you make sure that MP3 is selected. 5. At Bitrate, you select a bitrate (e.g., 192 kBit/s). 6. You also have the option to normalize the volume of all tracks. This will make the volume of all tracks on the CD roughly the same. 8. Click on the (+) button at the top right. 9. 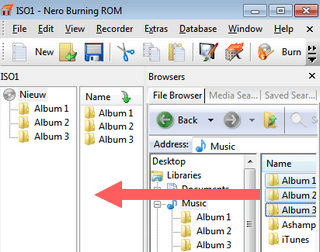 Go to the location on your computer where the songs or folders are stored you want to burn to a CD. 10. Select the songs or folders and click on the Add button at the bottom right of the Add Files and Folders window. Tip: At Free Space on CD located at the bottom of Ashampoo Burning Studio you can view how much MB in file size you have left on your disc (how much music you still can add to your disc). 11. 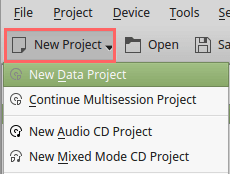 When you're done adding files or folders to your compilation, you click on Close at the bottom right of the Add Files and Folders window. 12. Click on the Next button at the bottom right. Ashampoo Burning Studio may convert your MP3 files. This may have something to do with the bitrate you have chosen. When the converting is finished, it will bring you to the next screen. 14. When you're ready, you click on the Write CD button at the bottom right. Ashampoo Burning Studio will start burning your MP3 CD. 3. Move your mouse cursor (pointer) on Music and then click on Create MP3 or WMA Disc. 5. At Bitrate you select a bitrate (e.g., 192 kBit/s). 8. Click on the Add button at the top right. Tip: At Free Space on CD located at the bottom of Ashampoo Burning Studio Free you can view how much MB in file size you have left on your disc (how much music you still can add to your disc). Ashampoo Burning Studio Free will start burning your MP3 CD. 3. Select "Data disc" and click on OK.
4. 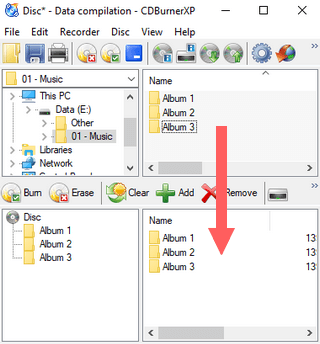 Go in the top section of CDBurnerXP to the location on your computer where the songs or folders are stored you want to burn to a CD. 5. Drag and drop the songs or folders from the top section to the bottom section. Tip: At the bottom of CDBurnerXP there's a bar that shows you how much MB in file size you have left on your disc (how much music you still can add to your disc). 6. When you're ready, you click on Burn. 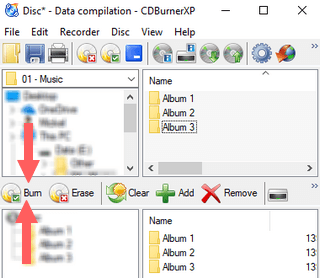 CDBurnerXP will start burning your MP3 CD. 3. Click on MP3 Disc. An MP3 Disc window will appear. 4. Click on + Add located at the top. 5. Go to the location on your computer where the songs or folders are stored you want to burn to a CD. 6. Select the songs or folders. 7. Click on the Add button at the bottom right of the Add files and folders window. 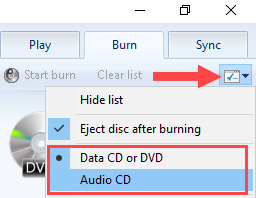 Tip: At Estimated size on disc located the bottom of Burnaware you can view how much MB in file size you have left on your disc (how much music you still can add to your disc). 8. When you're done adding files or folders to the compilation, you click on the Close button at the bottom right of the Add files and folders window. 9. When you're ready, you click on Burn located at the top left. BurnAware will start burning your MP3 CD. An Open or Select folder to add window will appear. 6. Select the songs or folder. Note: Folders need to be added one by one. 7. Click on the Open or Select Folder button at the bottom right of the Open or Select folder to add window. 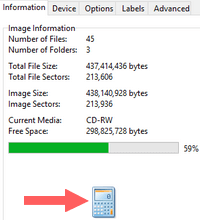 Tip: If you click on the calculator icon in the Information tab at the right, ImgBurn will calculate how much percentage of free space you have left on your CD (how much music you can still add). 8. When you're ready, you click on the folder ⇨ disc button located at the bottom. ImgBurn will start burning your MP3 CD. Place all MP3 files or folders in one folder and make sure that the total file size of that folder does not exceed the capacity of your CD (usually 650 MB or 700 MB). To view the file size of a folder, right-click on the folder and choose "Properties". 8. When you're done copying files/folders to your CD burner drive, you click on Drive Tools located at the top. Windows will start burning your MP3 CD. Tip: If I were you, I would use a CD-R instead of a CD-RW (rewritable), because not all CD players can play rewritable CDs properly. Tip: You can view the time in minutes or file size in MB you have left on your CD at _:_ free of _ mins (e.g., 20:03 free of 80 mins) or _ MB free of _ MB (e.g., 559 MB free of 702 MB) located just above the Burn list. 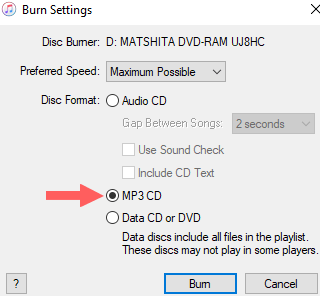 Windows Media Player will start burning your MP3 CD. 10. When you're ready you click on the Burn button located at the bottom of the Burn Compilation window. 3. Click on File at the top left, move your mouse cursor (pointer) on New and choose Playlist. Open Windows Explorer and minimize both the Windows Explorer window and the iTunes window, so that you will see both of them located next to each other, then go via Windows Explorer to the location on your computer where the songs are stored that you want to burn to CD and drag the songs from Windows Explorer to your playlist in iTunes. 6. 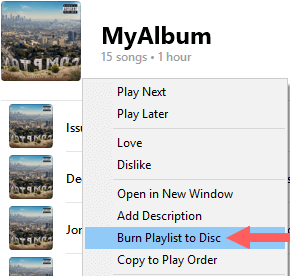 When you're done adding tracks to your playlist, you right-click on your playlist and then choose Burn Playlist to Disc. 7. At Preferred Speed you can select a burning speed. 8. At Disc Format you select MP3 CD. 9. When you're ready, you click on the Burn button located at the bottom of the Burn Settings window. iTunes will start burning your MP3 CD. K3b is a well-known disc burning application for Linux (e.g., Linux Mint and Ubuntu). 3. Click on New Project at the top and choose New Data Project. 4. 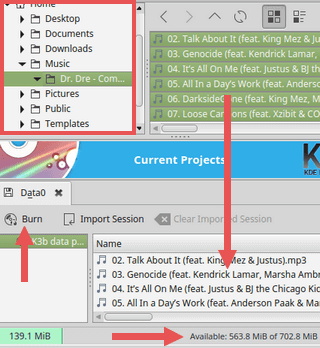 Go in the top section of k3b to the location on your computer where the songs or folders are stored you want to burn to a CD. 6. When you're done adding songs/folders to your compilation, you click on Burn. A Data Project window will appear with a few settings. 8. At Speed, you can select a burning (writing) speed. 9. 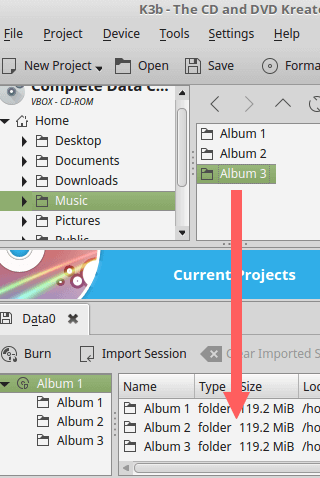 When you're ready, you click on the Burn button located at the bottom right of the Data Project window. K3b will start burning your MP3 CD. Brasero is a simple disc burning application for Linux (e.g., Linux Mint and Ubuntu). 4. Click on the + icon at the top left. A Select Files window will appear. 7. Click on the Add button at the bottom right of the Select Files window. Tip: At Blank CD-R Disc: _ MB of free space located at the bottom of Brasero you can view how much MB in file size you have left on your disc (how much music you still can add to your disc). 8. When you're done adding music, you click on the Burn button located at the bottom right. 9. When you're ready, you click on the Burn button. Brasero will start burning your MP3 CD. Xfburn is a simple disc burning application for Linux (e.g., Linux Mint and Ubuntu). 4. Click on the + Add button located at the top left. A File(s) to add to composition window will appear. 7. Click on the Add button at the bottom right of the File(s) to add to composition window. Tip: At the bottom of Xfburn you can view how much MB in file size you have left on your disc (how much music you still can add to your disc). 8. When you're done adding music, you click on the Proceed to Burn button located at the bottom right. A Burn Composition window will appear with a few settings. 9. When you're ready, you click on the Burn Composition button located at the bottom. 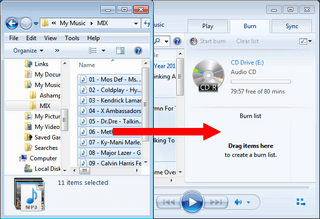 Xfburn will start burning your MP3 CD.